After achieving a dominant 2-1 victory in the T20I series against on the long England tour, India extended their winning streak in the ODIs as well. 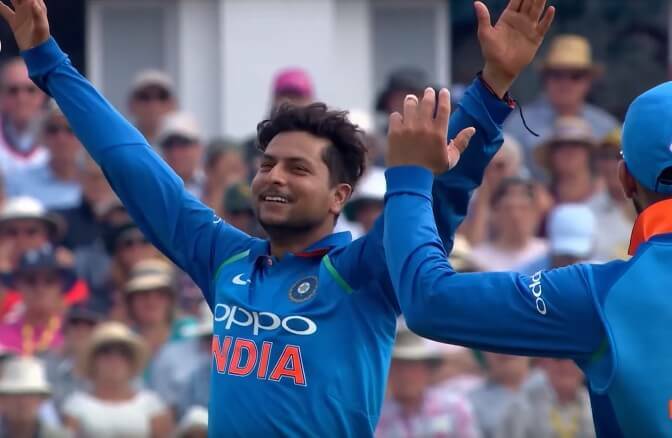 The 1st ODI at Trent Bridge turned out to be like a walk in the park for the visitors courtesy 2 standout performers – Kuldeep Yadav and Rohit Sharma. It was this very ground where England had bludgeoned 481 runs in an ODI against Australia a few days back. And when they started batting first after losing the toss, it seemed as if they were well on course for another big score. The openers Jason Roy and Jonny Bairstow went after the Indian seamers who were in the absence of the injured Bhuvneshwar Kumar. Both the right-handers found the boundaries on a regular basis as the score went past 50 in the 8th over. India didn’t find any success in the first powerplay and conceded 71 runs. It was a great platform for the hosts to build upon. But what had happened in the first T20I, repeated itself in Nottingham. Kuldeep Yadav came into the attack in the 11th over and sent back Roy off his 2nd delivery. In his next over, the chinaman struck twice to dismiss Joe Root and Bairstow. Kuldeep’s partner-in-crime Yuzvendra Chahal came to the fore and removed the opposition skipper Eoin Morgan to leave the hosts tottering at 105/4. Jos Buttler and Ben Stokes’s stand of 93 runs for the 5th wicket brought some solidity to the innings. It was once again Kuldeep who proved to be a thorn in the flesh for the hosts as he got both Buttler and Stokes out in his second spell. When he dismissed David Willey, he completed his 6-wicket haul which ended up as the best ever figures by a left-arm spinner in ODI cricket. Moeen Ali and Adil Rashid’s fighting knocks took England to 268. India’s chase began with a flourish from Shikhar Dhawan as he struck 7 boundaries in the first 5 overs. Rohit Sharma too joined in the act and in no time, the score was past 50. Dhawan was looking set for a big one but lost his wicket in the bid to go for a big shot to Moeen. Virat Kohli joined Rohit Sharma at the crease and the duo formed a sublime partnership. Rohit carried on from where he left in the last hundred in the 3rd T20I and Kohli too was in the evergreen touch. They paced the chase superbly and turned the strike over regularly and mixed that with boundaries on a consistent basis. Both of them got to their half-centuries and England were nowhere in the hunt. Rohit got to his 18th ODI century in the 31st over as India were cruising towards victory. After adding 167 runs for the 2nd wicket, Kohli got out to Rashid in the 33rd over. He scored 75 off 82 balls and left India on the cusp of a victory. KL Rahul and Rohit then completed the formality and took India to a victory by 8 wickets and to a lead of 1-0 in the 3-ODI series. Oh @ImRo45 you are just a beauty to watch! The last time Virat Kohli got out STUMPED in any format of international cricket was in 2011 – that's 312 innings ago! Fair to say @ECB_cricket have been the best side for a while but this will be a great series . @BCCI @imVkohli @ImRo45 in good touch. Gonna be one amazing World Cup next year in England. Back to back hundreds from the Hitman. Well played @ImRo45 super form and making the most of it. England just not looking the number 1 side at all. Federer, football and cricket- you don’t want to be a Eng sports follower.